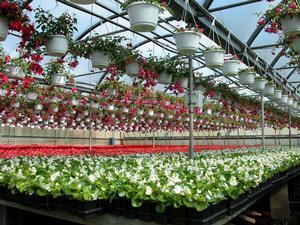 Wholesale only: We are a wholesale greenhouse, you will have to create a customer account to purchase. Customer Pick-up: Please place orders at least one day before pick-up. Orders require one day to process. Your cooperation is appreciated! Advance orders: Here at Babikow greenhouses, we love advanced orders! Orders placed in advance will be delivered or picked up according to scheduled delivery time. Otherwise, plant material will become available for sale. Cancelled orders: A 20% restocking fee will be charged for cancelled orders which have been processed. Claims: We honor claims made within three days after receiving plants. Guarantee: We guarantee plants to be true to name. Labeling: Plants intended for retail sales have an identifying label with relevant information including planting instructions. Bar codes have been assigned to each plant variety. Packaging: Annuals and pansies are in plastic pots and pack 18 per tray. Perennials are in plastic pots and pack 12 per tray. Visitors: Nursery visits are encouraged. Please make an appointment for a guided tour.